Trader Joe’s has a magical ready-made pizza dough that makes the most delicious home cooked pizzas. I have been making pizza with it since I started shopping at Trader Joe’s over a decade ago, and I have perfected the art of handling their dough. I get asked about it a lot when I am buying at the store, because people are afraid to try cooking with it. 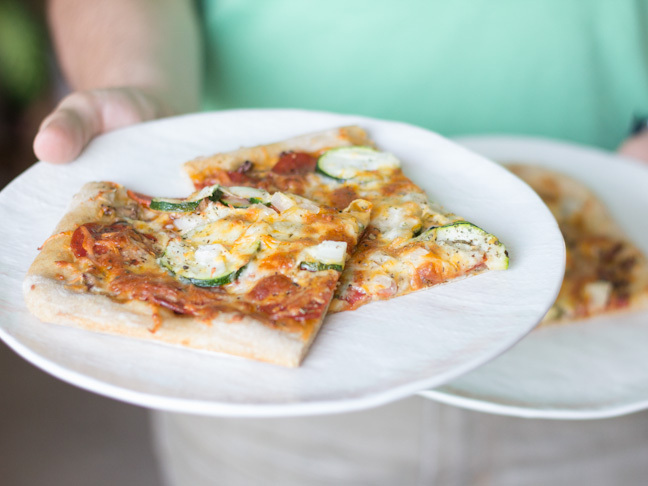 It can be very tricky to handle, as some people think it is too sticky to work with, but with a bit of flour and patience you too can be making custom pizzas at home in no time. 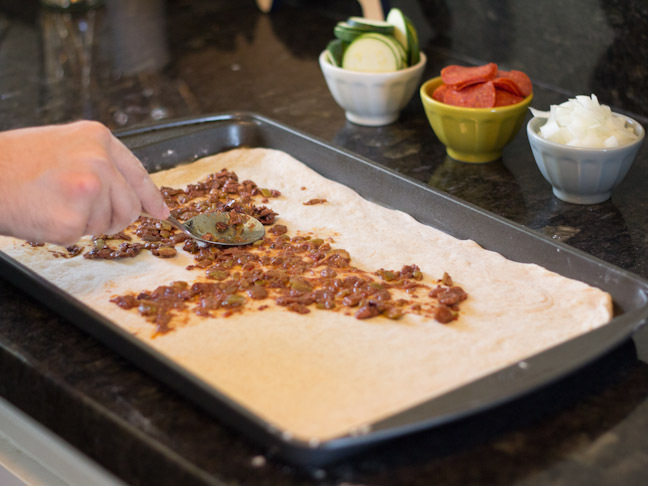 My tips for making perfect pizza at home using Trader Joe’s pizza dough are below. 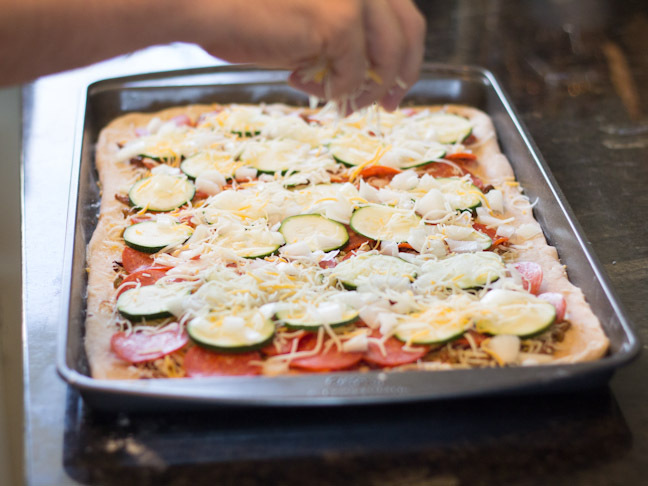 And if you’re looking for more inventive ways to dress up your pizza (that your kids will love, too), check out the slideshow for easy and tasty homemade pizza recipes. 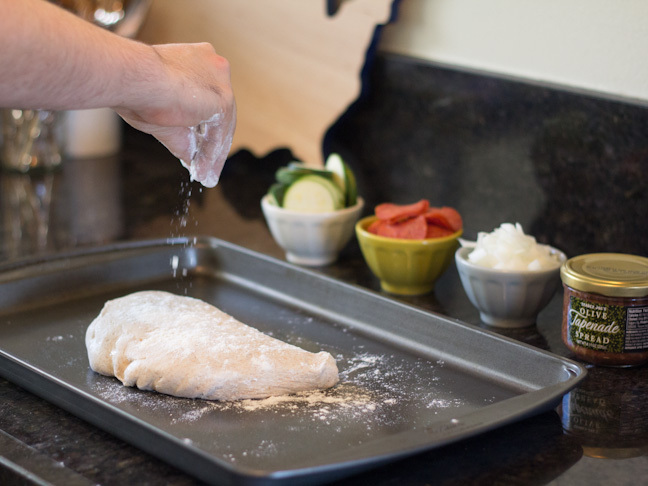 That sticky dough can be hard to master...but not when you're armed with these tips. pizza sauce of choice (pasta sauce, pesto, or just plain olive oil): 8 oz. shredded cheese (I prefer Trader Joe's light three cheese blend. ): 6 oz. 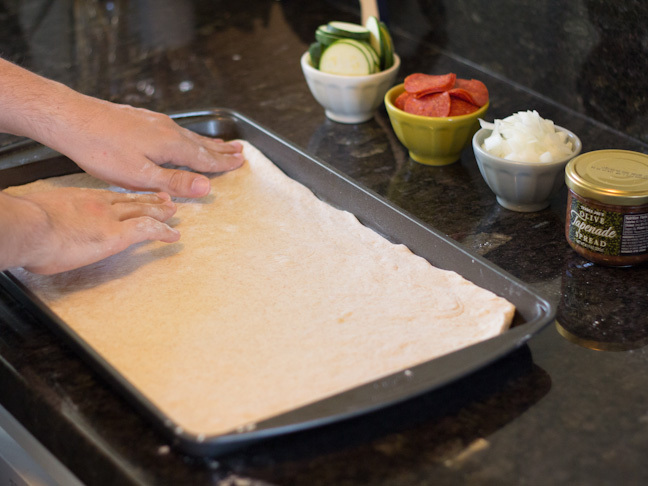 Step 1: Prep your pizza dough. Timing is everything with this pizza dough. 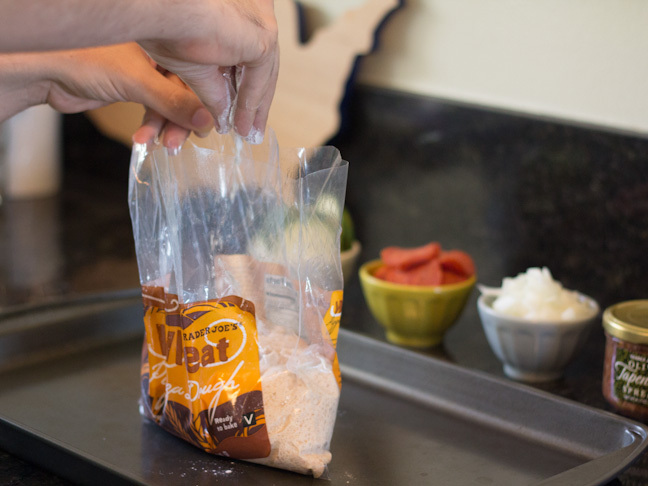 It needs to be refrigerated, but you want to let it sit out for around 15-20 minutes to let it come up closer to room temperature to work with it. 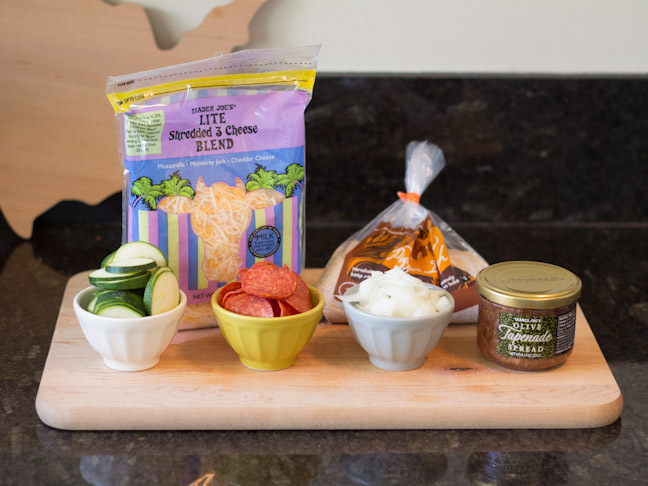 Use the time it is sitting out to slice your pizza toppings and prep your other ingredients. Also be sure to preheat your oven to 450 degrees. Step 2: Turn the dough into a crust. This dough can get really sticky, so I start by putting about a teaspoon of flour into the bag and getting the surface of the dough covered. Then I cut away the rest of the bag and make sure the whole surface of the dough has some flour on it. 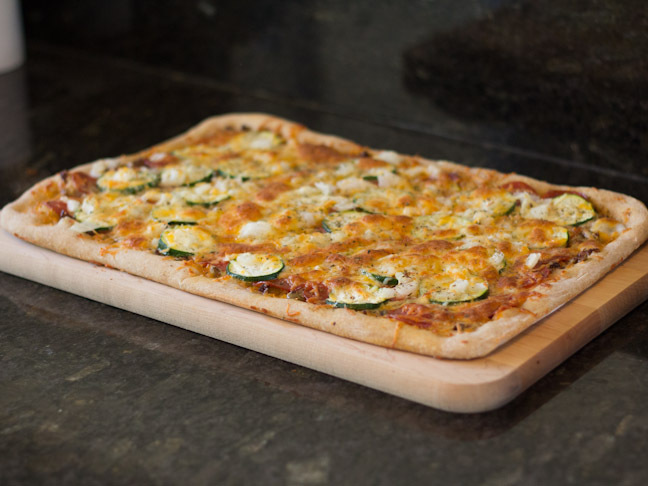 I like to bake my pizza on a cookie sheet, as it keeps the size uniform, and you can get a larger pizza out of it than you would if you were cooking on a pizza pan. Step 3: Work the dough into a rectangle so it fills the full space of your cookie sheet. This is a dough you have to push with your fingertips and work slowly with. 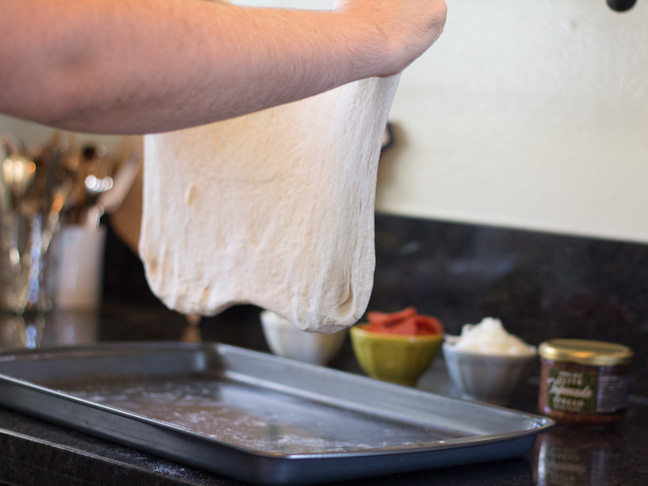 Don't try to flip it like you see the guys do at the local pizza parlor; instead, keep it close to the pan and let gravity pull the dough larger as you flip it over in your hands. Be careful not to get it too thin in any places, as you will end up with a hole in the middle of your pizza. It's best to let the natural shape of the dough work for you instead of trying to force it in a new shape. The edges of the cookie sheet are especially helpful as you can get the edges to stick to them a bit and help fill out the pan. Step 4: Apply your sauce. I've gone through many variations of sauce in my time making this pizza. My current favorite is to use Trader Joe's olive tapenade spread as a base layer. Other options include the classic tomato sauce, pesto sauce, Trader Joe's bruschetta, or just plain olive oil with sliced tomatoes. Use the back of a large spoon to get even coverage. 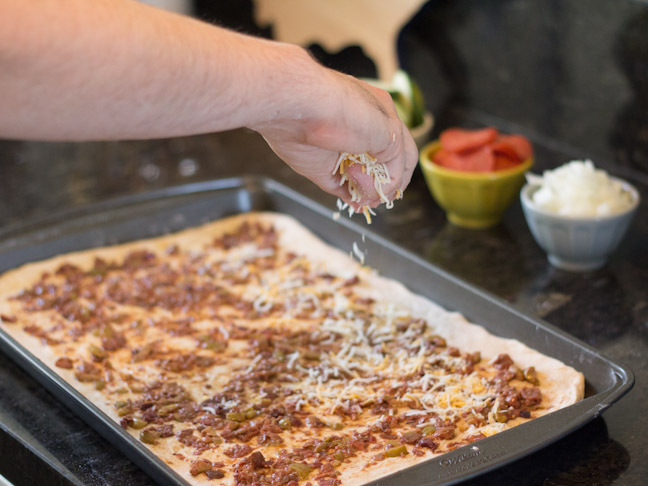 Step 5: Apply a base layer of cheese and your toppings. I like to start with just a bit of cheese, and then load up the toppings and put the majority of the cheese on top. Pizza toppings are one of our nation's great debates, though, and you can customize this part however you like. This could be an especially great way to get the kids involved in making dinner, by letting them choose their own toppings. Step 6: I like to add a dash of Italian seasoning on top, and then throw it in the oven. These pizzas cook surprisingly fast and should only need about 8-10 minutes in the oven. It all depends on how crisp you like your crust, so just keep an eye on them and pull them out when you start to see your cheese browning and bubbling. Step 7: Once you take it out of the oven, transfer the pizza to a large cutting board and slice. Be sure to let it cool for a few minutes before serving. And voila! 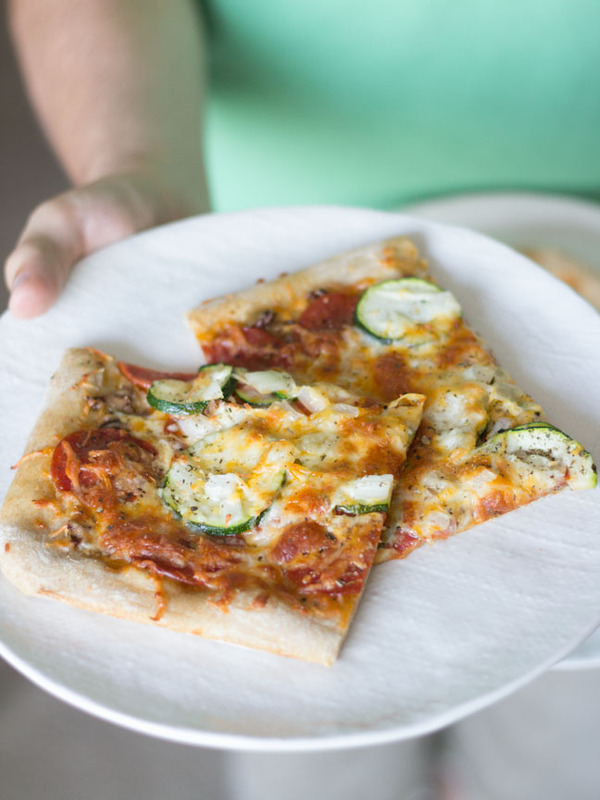 A delicious homemade pizza dinner in just about 30 minutes!